Do you have trouble maintaining your hairstyle? There are different tools you can use to optimize the way your hair results turn out. If you have hard to manage frizz and curls, there may be a solution to your hair issues that won’t cost you a ton of money. You can try to use diffuser to help with you issues. They are available in two types. Some are hardened plastic and the other type is made of a foamy material. The diffuser mad e of plastic give curls a tighter and more defined result. The foam diffuser allows the hair and curl to relax. They both address the issue of lessening frizzy hair and ends. You can purchase a diffuser at and salon supply store or even drug stores. Here is how to use a diffuser. Wash your hair. Use the shampoo of your choice. Clean the scalp well. Condition your hair. Wring the hair out by hair and put in the condition on damp hair. Pay special attention to the ends of the hair during this step. Rinse the conditioner at of the hair after several minutes with warm water. Now, add the leave in conditioner to the hair. Tie the hair up with a towel. Finish your shower. Remove the towel. Distribute all leave in conditioner evenly throughout the hair. Use your favorite hair products to maintain your style. Use a serum on the hair if you want to keep frizz under control. You can apply your favorite hold style products as well. Decide whether you will use mousse or gel. Use the fingers to lift the hair to encourage curl and volume. The more you do this, the bigger the hair. If you don’t use the fingers to life the hair then there will be less volume. 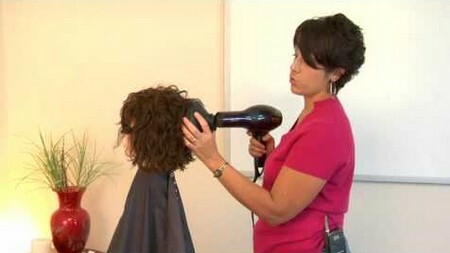 Place the diffuser on the end of the nozzle of your blow dryer. If you have to take off the original attachment on the blow dryer then do so. Check to make sure the diffuser is clamped completely into place. Diffuse the damp hair until it is completely dry. Try to lean over while diffuse the hair to give it space to increase in volume and body. Apply more hair serum in necessary places. Remember to use your fingers as tools to life the hair. Be careful not to over expose some of the sections of hair to too much heat. Move the diffuser in even sweeping motions. Don’t allow it to stay on one part for too long. You can dry hair out and make it brittle.